Picture yourself relaxing onboard a luxury yacht cruising Sydney Harbour and watching the Sydney Harbour Bridge and Sydney Opera House pass you by. Or perhaps gazing out at the beautiful Pacific Ocean with the white sands of Bondi Beach between your toes. Or even cuddling a koala and feeding a kangaroo. All of these amazing experiences and many more await you in Sydney. Sydney is a dream city with a spectacular harbour, stunning scenery and so many magical experiences that make any visit here exciting and memorable. Why else do you think over 1 million people just like you travel to Sydney every year? Welcome to SNF Travel Sydney. We are so glad you’ve decided to visit our beautiful city. We are here to help you plan your holiday so it is everything you dream it to be. You will find everything you need right here to plan your perfect vacation – from accommodation Sydney to things to do in Sydney to insider tips for making the most out of your stay. Planning your holiday is fun and exciting. To get started, fill out the form below to download your free SNF Travel Sydney Australia Guide Book. An overview of Sydney's top attractions and experiences. Tips to help you plan your perfect itinerary. The secret to saving money while making your holiday more fun. Just enter your details and click the free instant access button and I will send you the free guide immediately by email. 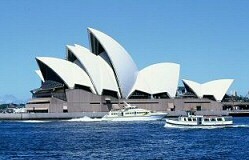 When are you travelling to Sydney? Subscribe for your free email newsletter for great tips and your FREE 26 page Sydney Australia Travel Guide ebook.